In short - You make a huge mosaic, with a pre-prepared design (or design your own). 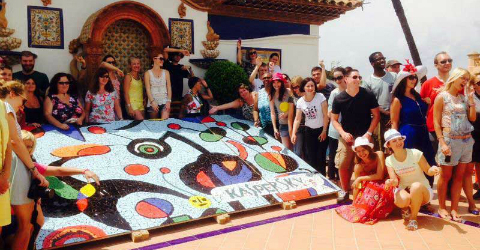 We have worked with a group of 70 people, who made a gigantic Joan Miro inspired piece, in under 3 hours; and one group of 150 people who created a beautiful giant mosaic in just 1.5 hours - from start to finish, as just two examples. You don't have to be 'artistic' to create incredible mosaics... this activity is open to everyone. We can 'house' this activity in a location to suit you and your group. We do, however, suggest some shade from the sun. An outdoor space is ideal, giving plenty or room for large scale creativity, although indoor spaces work very well too; smashing tiles produces noise and a bit of dust, as well as smaller fragments of tiles - but nothing terrible! We've done this activity in carpeted rooms, with no problems or complaints from the hotel used. Upon arrival at your chosen destination, you will find all the Mosaic supplies ready for you, as well as our creative team (who will be wearing smiles). No previous experience is required, as our team will give participants an introduction to all aspects of Mosaic Making; starting with a demonstration of cutting techniques, template making (if you're designing your own), using moulds, how to use adhesive backing and grouting, followed by guidance with design ideas. We provide basic safety equipment (rubber gloves, and eye protection where needed) and all of the necessary work tools. Some groups or individuals may like to bring unique items with them to use in their group mosaic - a piece of glass, pottery fragments, or small tiles, for example - to give their finished piece a 'personal' touch. Unless you specifically want to work in cement, we use specially prepared boards with high-tack adhesive backing. These are light-weight and easily transportable, should you like to keep the artwork afterwards (as most groups do!). Teams will create some wonderfully creative pieces of art. Drawing on inspiration and working as a team, we can achieve some truly impressive results. Yes, we are able to supply some lovely food and drink options, to suit your requirements. Experience a huge sense of achievement while exploring patterns, shape and design to create a unique and wonderful piece of art. This activity takes approximately 2 to 2.5 hours, but timings can be altered to suit your requirements, where needed. Our prices include the team building activity, all equipment and team members.